Copyright © 2003, S Helper Service, Inc. Thank you for your purchase of a DCC equipped F-7 A/B from S Helper Service. S Helper Service is pleased to continue its pioneering efforts in S scale – releasing a new plug & play DCC sound decoder for the F-7 locomotives. S Helper Service has partnered with SoundTraxx, the leading manufacturer of DCC sound decoders, to bring you a locomotive that is pre-wired with DCC controlled lights and sounds, ready to run! If you received your F-7's without the DCC Sound decoder installed at the factory, you'll need to perform the installation before starting. Installation is very simple - no soldering or special wiring is required – the DCC decoder itself plugs right into the socket in the F-7. Just remove the cover on the F-7 A unit, remove any AC sound unit or DC shorting plug that is installed, and plug in your DCC sound decoder. It's that simple. For those who are a bit nervous, Appendix A describes the installation process with photos. The B unit is controlled by the DCC decoder in the A unit. See note 1 below for more information on connecting the B unit. CAUTION! Before you put your locomotive on the DCC controlled layout, make sure that the DCC system is set to deliver 16V or less to the layout. On most systems this corresponds to “N”, “HO”, or “NORMAL” settings as labeled by the DCC system manufacturer. DO NOT use this decoder on any layout that is set to “O” or “G” settings or is set to deliver more than 16V to the track! Operating this DCC Sound Decoder on track voltages greater than 16V will void your warranty, generate excessive heat, and possibly permanently damage your decoder. So put your locomotive on the DCC layout and start running. Select address 3 and give it a try - you'll be impressed at how easy it is to control the locomotive and special effects. Some DCC systems require that you take some action to identify whether the decoder at a particular address has 14, 28, or 128 speed steps. The DCC decoder comes pre-programmed for 28/128 speed steps. Follow the procedures specified by your DCC system manufacturer to set the address of your decoder to 128 speed steps if that option is available, otherwise set it to 28. You'll also notice at that the decoder is pre-programmed to ramp up the engine RPMs sound through eight distinct notches as the engine is accelerated and ramp down as the engine begins to slow. Try out the functions above to see all the special effects that are built right in. Of course that is not all -- the programmable features of the DCC sound decoder make its operating characteristics highly customizable. Everything from speed curves to selection of three different horns, changing which function controls a particular special effect, selecting the second headlight (Hyperlight) special effect (MARS, Gyralite, single strobe, etc. ), setting up the headlight for Rule 17 operation and changing the volume of the various sounds can be modified. The DCC sound decoder also supports consisting, and numerous other features. Consult the DCC Decoder Owner's Manual enclosed with your locomotive or decoder for additional information on tailoring the locomotive to fit your needs. In the event you want to have separate DCC control and/or sound in the B unit, the B unit is also factory-ready for its own DCC sound decoder and is factory-equipped with a speaker. All you need to do is purchase a second DCC sound decoder, remove the cover, and plug it in. Now you'll have independent control of each F-7 unit, and of course double the sound! Remember to assign a unique address to the B unit decoder, and you can create a multi-unit lashup (aka consist) with the A unit if desired. To order another DCC sound decoder, contact either your dealer or S Helper Service directly (1-800-465-0303 or via the web site at http://www.showcaseline.com) and order S Helper Service part number 01199 ($179.95 each). If you install a decoder in the B unit, DO NOT use the MU cables between the A & B units. For Lenz Set-01 users, we recommend that you make sure your command station and LH100 throttles have been upgraded to Version 3.5. Version 3.5 gives you access to 4 digit locomotive addresses, up to thirteen functions, the ability to individually set F1-F8 as non-latching which is key for sound decoder users, and many other new features. Please contact your Lenz dealer or Lenz Electronics directly. Their web site is http://www.lenz.com or you can e-mail them at support@lenz.com, or telephone them at 1-978-250-1494. Some users of early NCE Powerhouse Pro DCC systems may see a situation where the DCC equipped locomotive runs fine on their layout. But when the B unit is connected via the MU cables and the user attempts to run the locomotive, the booster shuts down and reports an overload or short condition via the front panel LED on the Powerhouse Pro. If this occurs please contact NCE for a chip upgrade for your Powerhouse Pro. 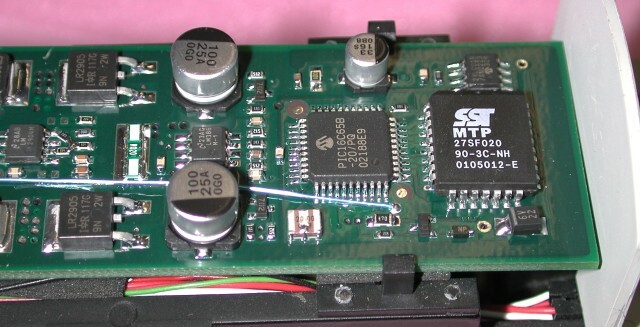 It seems that on some older systems, the power station was especially sensitive to shorts, and when some SoundTraxx decoders are placed on the layout, the capacitors that are charging on the decoder look like a short to the Powerhouse Pro. NCE has already found and fixed that problem, and has a chip upgrade available to you if you find this situation. NCE can be reached via their web site at http://www.ncedcc.com or via telephone at 1-716-671-0370 (9am-4pm ET). Users of some early model Digitrax Chief command stations (DCS100) may experience the situation where the motor, headlight, horn, bell, number board lights and dynamic brakes sounds work, but Functions 5, 6, 7 and 8 do not work. You can generally correct this situation for control of this decoder by programming a value of 4 into CV30. Since many new decoders support more than four functions, if you experience this situation you may also wish to contact Digitrax at some point about an upgrade for your Chief. If you do get your Chief upgraded, remember you may need to reset your decoder to remove the value of 4 in CV30. The decoder delivers good crisp sound at the mid-range factory setting! For those who want either a little more or a little less sound, you can customize the configuration of the decoder to alter the volume of each of the sounds (up or down). See the decoder manual for more information. Remove the two screws that hold the cab floor in place (between the engineer and the fireman). Underneath the cab floor on each side you will see two 2-pin connectors. The connections on one side go to both headlights, and the connections on the other side go to the number boards. Swap the two connections on the side where the wires go to the headlights. This should be on the fireman’s side of your loco. Please note that the connectors are NOT "keyed". So be sure when you reconnect them, that the red wire connects to the red wire and the white wire connects to the white wire. All done. Replace the screws that hold the cab floor in place and then replace the shell. This should work for all the environments where there is both a headlight and MARS light. In addition to changing the location of the MARS light as described in item 6 above, the DCC decoder makes changing the light effect for the headlight (Function 0(F0)) and/or the MARS light (F5) very easy. There is a configuration variable (CV) that can be programmed to your choice of values. For example if you want F5 to turn on a Gyralite instead of a MARS light, simply change the value of CV52 from 2 to 3. All set. See the technical manual that came with your S Helper Service DCC Decoder for more information. Some of the options are: on/off light, MARS light (default for F5), Gyralite, oscillating headlight, single flash strobe, double flash strobe, D312 rotary beacon, and Prime Stratolite. If you need to install your DCC sound decoder, it is very easy to do. Just follow these simple steps. Pictures are included to assist your work. Remove the fourPhilips screws show in the photograph on the next page -- two at each end of the underside of the locomotive. We recommend the use of a #0 screwdriver. (Wehave found that the #0x4-inch screwdriver made by General works well. General’s item number is 702, and the screwdriver is available from Walthers as item number 285-702.) Sometimes the screws are tight – make sure the screwdriver engages the screw firmly to reduce the risk of stripping. Now you can turn the locomotive right side up, and remove the shell. If this is the first time the shell is removed it may be a little tight. Sometimes it may help to remove the pilot. There are two screws on bottom of the nose that hold the pilot in place. Please take care with the rear of the loco shell to avoid damaging the"hoses". Another approach that may help is to insert a screwdriver through the sprung rear door on the locomotive and carefully press down on the frame. 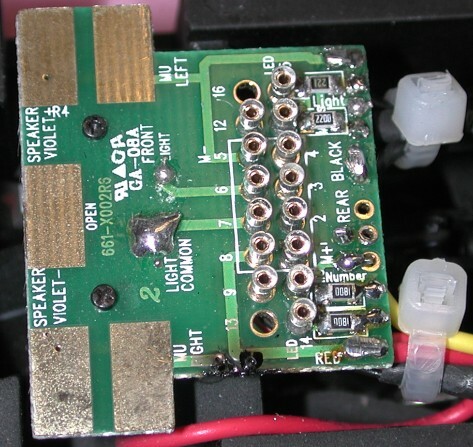 With the shell off, remove any AC/DC Sound Unit or DC Shorting plug that is in place. The photo to the right is a close-up of the F-7 socket, as it would appear without the DC shorting plug or with the AC/DC sound board removed. Since the plug is on the decoder board, it will obviously only fit in one direction and still allow you to put the shell back on. Examine the decoder and you will notice that the plug is on the bottom (non-component) side of the decoder. Orient the decoder in your hand so that the plug end of the decoder aligns with the socket of the locomotive. Now slide the right end of the decoder UNDER the two metal tabs as show in photo at the top of the next page. DO NOT attempt to snap the board over the tabs, as the tabs are metal (not plastic) and will not bend! You will need to slide the decoder almost all the way to the back wall of the cab. No w while carefully watching the pins on the decoder plug, align them with the socket and press in. You will note that there are two small cutouts in the decoder board where the other pair of metal tabs are nearer the socket.